For this essay, my professor asked us to analyze how a given animated film uses dimensionality to formally and technologically give the movie a sense of life. I chose write about Vincent Paronnaud and Marjane Satrapi’s film Persepolis through Thomas Lamarre’s theories of animation as outlined in his book, The Anime Machine. Key themes of animation are used to enliven the world of Vincent Paronnaud and Marjane Satrapi’s animated film, Persepolis (2007). As an adaptation of a graphic novel of the same name, the story finds its origins in a flat aesthetic common to all comic book media. However, in the translation to an animated feature, new technological affordances can be made to make Satrapi’s life in Persepolis feel more tangible. Most notably, Paronnaud and Satrapi use the medium of animation itself to give what was a strictly two-dimensional story a new sense of perceptible depth. To elicit a sense of depth from the flat pages of the Persepolis graphic novel, the directors use two techniques that film scholar Thomas Lamarre calls “cinematism” and “animetism” in his book, The Anime Machine: A Media Theory of Animation. To define these terms, Lamarre begins by referring to Paul Virilio’s assertions about the effect of speed. He uses the example of the environment blurring as one moves through it on a train or in a car. According to Lamarre, Virilio believes that that the blurring of the scenery, whether it is in a vehicle or by proxy through the camera or television screen, is itself a form of art. Virilio uses the term cinematism to define the phenomenon of seeing motion parallax as art. For Lamarre, Virilio’s definition makes the concept applicable to both film and animation. However, focusing only on this “perceptual logic” precludes another important technique for producing a sense of depth and dimensionality, one that is often used in animation. Lamarre contrasts cinematism with a parallel operation he calls animetism. In animetism, the audience is not taken along a Cartesian z-axis through the environment. Instead, the scene is separated into several different overlapping layers. These planes – generally designated as foreground, middle ground, and background – move across the screen horizontally or diagonally. Through the composition of the planes, this produces a multiplanar “diorama effect” which creates an imagined depth where previously there was none . Importantly, Lamarre is careful to say that cinematism and animetism are “potential tendencies of the moving image,” and therefore are not exclusively restricted to either animation or live-action cinema. In other words, animetism and cinematism may appear in animated films. Animetism plays a critical role in Persepolis. 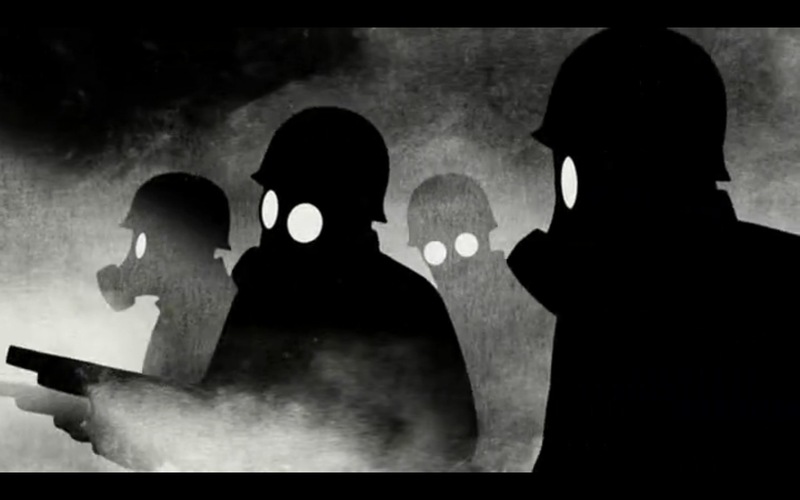 In one short scene towards the beginning of the film, protestors are shown in silhouette form against a background shrouded in fog. When police show up in gas masks, the two parties clash until a bullet is loosed which strikes one of the protestors. The action ceases as the other protestors pick up and carry their fallen comrade away. During this protest, there are several instances of animetism. In one instance, when the sequence opens, protestors are running from right to left across the screen. Some of the figures are positioned in the foreground, large and unobscured by fog. Others are smaller and less-defined, giving the impression that they are farther away. When the police enter from the right in pursuit of the mob, they are also positioned according to size across the different planes with fog flowing in between the foreground and background. By sandwiching the fog in such a way, Paronnaud and Satrapi accentuate the fact that this is a three-dimensional world with depth along the z-axis. Note, however, that the camera never moves into the frame, and the figures never change in size; therefore, this is not cinematism, but animetism.